A: First of all, I would first like to recommend Monsignor Peter Elliott's excellent guide "Celebrations of the Liturgical Year" published by Ignatius Press in 2002. It is a very useful resource for all those involved in the practical aspects of liturgical planning. The duration of such veiling varies from place to place. The custom in many places is to veil from before first vespers or the vigil Mass of the Fifth Sunday of Lent while others limit this veiling from after the Mass of the Lord's Supper on Holy Thursday. The bishops' conference may decide if the veiling during this period should be obligatory within its territory. 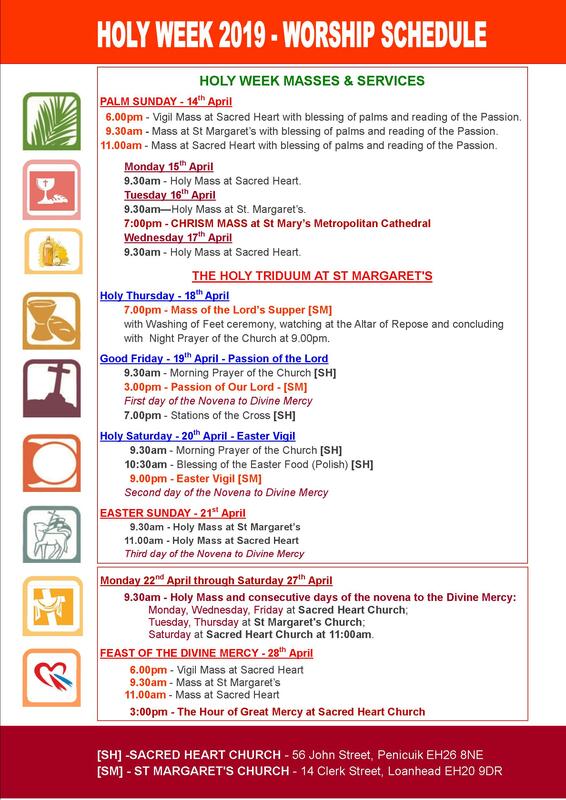 The custom of veiling the images during the last two weeks of Lent hails from the former liturgical calendar in which the Passion was read on the Fifth Sunday of Lent (hence called "Passion Sunday") as well as on Palm Sunday, Tuesday and Wednesday of Holy Week, and Good Friday. For this reason the period following the Fifth Sunday of Lent was called Passiontide. A remnant of this custom is the obligatory use of the first Preface of the Lord's Passion during the Fifth Week of Lent. As Monsignor Elliott remarks, "The custom of veiling crosses and images ... has much to commend it in terms of religious psychology, because it helps us to concentrate on the great essentials of Christ's work of Redemption." This cloth, called the "Hungertuch" (hunger cloth), hid the altar entirely from the faithful during Lent and was not removed until during the reading of the Passion on Holy Wednesday at the words "the veil of the temple was rent in two." After the ritual of public penance fell into disuse — but the entire congregation symbolically entered the order of penitents by receiving ashes on Ash Wednesday— it was no longer possible to expel them from the church. Rather, the altar or "Holy of Holies" was shielded from view until they were reconciled to God at Easter. The rule of limiting this veiling to Passiontide came later and does not appear until the publication of the Bishops' Ceremonial of the 17th century. According to Horace, "Quandoque bonus dormitat Homerus." Sometimes even excellent Homer nods. Although the only thing I share with the author of the Trojan epic is a penchant toward nodding, I certainly drooped in my piece on veiling statues during Lent (see March 8). In that column I affirmed: "The custom of veiling the images during the last two weeks of Lent hails from the former liturgical calendar in which the Passion was read on the Fifth Sunday of Lent (hence called 'Passion Sunday')." In this, as pointed out by several readers, I erred. In fact the Passion was not read on the Fifth Sunday of Lent, even though the Sunday was called Passion Sunday and the period that followed it Passiontide. The Gospel for this Sunday was John 8:46-59, the discussion between Jesus and the Jewish authorities which ended in a frustrated attempt to stone him. This reading is now found, in a slightly briefer version, on Thursday of the fifth week of Lent. In the former liturgy, the daily Gospel readings following Passion Sunday were all taken from John and evoke the increasing tension between Jesus and the authorities that eventually lead up to Good Friday. The present cycle of readings for the latter part of Lent evokes the same basic theme although the texts — also taken from St. John — are organized in a different manner. On the question of veiling statues and crucifixes, a Virginia reader asks: "Our parish covered all images, including the crucifix on the altar, on Ash Wednesday. Apparently they will be unveiled on Saturday, March 26, 2005, at the Easter Vigil. Also, all of the holy water was removed from our parish as of Ash Wednesday." Veiling during all of Lent may have been a common practice in the Middle Ages, but it has been restricted to Passiontide for several centuries. Hence, the practice our reader described is incorrect. The altar or processional cross is not veiled and, indeed, its use is implied in the rubrics for the solemn Masses of Palm Sunday and Holy Thursday. As mentioned in the previous column, the crosses are unveiled after the Good Friday ceremonies while other images are unveiled, with no ceremony whatsoever, before the Easter Vigil — not at the celebration itself. "1. The liturgical legislation in force does not foresee this innovation, which in addition to being 'praeter legem' is contrary to a balanced understanding of the season of Lent, which though truly being a season of penance, is also a season rich in the symbolism of water and baptism, constantly evoked in liturgical texts. "2. The encouragement of the Church that the faithful avail themselves frequently of the sacraments is to be understood to apply also to the season of Lent. The 'fast' and 'abstinence' which the faithful embrace in this season does not extend to abstaining from the sacraments or sacramentals of the Church.